Convnience, and most of all, safety - these are the things that we want for our family and home, right? And that's just what home automation is providing you. In this article, I am going to specifically talk about home automation temperature monitoring. The peace of mind that this system is going to bring you is going to be worth the installation cost, I can assure you that! Now let me give you the 4 reasons why it is best for your home and your family to have home automations temperature installed. Temperature monitoring is one of the features of a home security and automation system that can really save you money if you use it properly. While it may not necessarily be a feature that you need, once you learn about the many benefits it offers, and how little it costs, you will likely be interested in adding it to your home. When it comes to home security your first priority should be having a great home security system to keep yourself, your family, and your possessions safe. The great news is that you can have all of this while also adding an impressive assortment of home automation systems including temperature monitoring. Modern technology really does allow us to do many things that people in the past would have considered impossible, so why shouldn't you take advantage of this? Remote home temperature monitoring offers you convenience and will help to save you money as well, which makes it a great addition to your home security and automation system. Why is it important to be able to control your thermostat when you aren't home? A big reason is the force that drives the world, money. Electricity is expensive and the cost is only going to keep going up. The cost is especially high during the summer, so finding ways to lower your electricity usage during this time of year should be a priority. While the amount you pay is going to depend upon where you live, how much electricity you use, and how much your rate is, finding ways to lower your overall usage is the only surefire way to save money. So if you an remotely turn up the thermostat when you aren't home, which will lower your electricity usage, then why wouldn't you want to do that? On top of being able to raise or lower your thermostat remotely, temperature monitoring offered by most home security and automation companies can also be programmed ahead of time. That means you can program your home to have a higher temperature when it won't be occupied since keeping it cool won't be a priority while nobody is home. Then if you realize that you forgot you are expecting company come by after work then you can simply remotely lower the thermostat so that everyone will be comfortable when they arrive. Remote temperature monitoring may not seem like that big of a deal, but it really is a useful feature that most people love. Did you know that in 2015 there were over 365,000 house fires? Did you also know that those fires resulted in the deaths of over 2,600 people, and resulted in injuries to an additional 11,000 plus people? Those are staggering numbers that should show you just how seriously you should take the threat of a fire. The great news is that you can actually do a lot using modern technology to help protect your home in the event that there is a fire when you are not home. A heat sensor can be programmed to detect the presence of excessive heat, which can then trigger the thermostat to shut down so that air won't continue to circulate. This will not only help to slow the spread of the fire, it will also help to limit smoke from filling your entire house. This will help to limit damage, and more importantly if you or a family member is home during a fire it could help to save lives. While the fear of a fire is an obvious issue, not as many people realize that cold temperatures can pose significant problems as well. If the temperature in your home drops too low you could end up with frozen pipes. When water freezes inside of a pipe it expands, which can lead to a pipe bursting. If you are lucky the water will be so cold that it remains frozen and doesn't come pouring out into your home. If you aren't lucky, which is the more likely scenario, then you are going to end up with a flood. That in turn will require cleanup, repairs, and possibly even mold removal. When you get a low temperature sensor that you link up to your home security system you can automate it to turn up the head automatically if the temperature in your home gets cold enough that your home could be damaged. This is a great feature to have in the event that you are going to be leaving your home for a while during cold weather. You don't want to have your thermostat on while you are out of town since heating your house will be a waste of money. But you still need to keep the temperature warm enough so that you don't have to worry about coming home to a huge mess when your pipes burst. The best thing about this kind of setup is that you can automate it so you never have to worry about freezing temperatures causing damage to your home. Modern technology is all about making our lives better and easier. 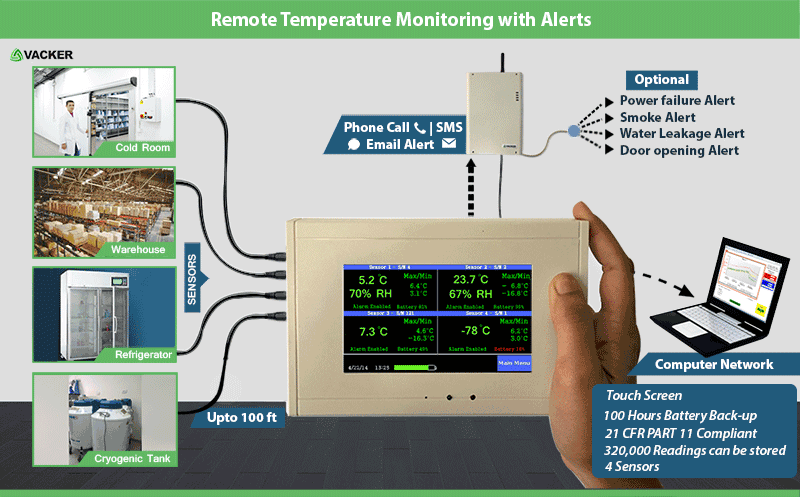 Do you need remote temperature monitoring? Probably not, but the benefits of having it makes it well worth the small amount of money it will cost you every month. Look, you have to have a home security system if you want an effective deterrent that keeps most criminals away. Since a home security system is a must anyway, there really isn't a good reason to add remote temperature monitoring to your system. Not only is the convenience great, a temperature monitoring system can also protect your home from fire damage, or freezing pipes. So if you are in the market for a new home security and automation system, or you have one that you want to upgrade, make sure that you have temperature monitoring set up as a feature in your system.